Drew Ballard is a dealer. By day he dresses in a uniform with a badge and stands in a courthouse, handing out the warm security of a watchman scanning through everyone’s personal items, their clothing, and their intentions. At night he dons the costume of a 1980’s hair metal god; spandex cloaked in leather chaps, a woman’s wig topped off with a fishnet shirt, delivering good vibes in the audible form of searing guitar riffs. Somewhere in between, Ballard sells local products and services with the jingles he creates and records in his home studio. He actually does sell drugs for money, but there’s so much more of Drew to go around than a dimebag of sunshine and roses. He meets the cinnamon-scented Layla at a dinner where his cover band provides the soundtrack. As their relationship blossoms, Layla’s father, a movie executive, hires Drew on to score his zombie fueled rom-com. However, despite the potential for Ballard to leave his go-nowhere lifestyle behind, the slimy Barron Vaughn, digs his claws into Drew’s mysterious past, manipulating the course of events to follow. Gordon Highland’s debut novel is written in a present-tense that reads less like a novel and more like a friend recounting the failings at a fight against history repeating itself. It is in Layla that Drew finds peace and hope, the inspiration to tame the inner-rockstar within a world of excess, a world where he would normally supply the manna in all of its forms. The narrator, Drew himself as he writes his memoir, is slathered in tongue-in-cheek wit and sarcasm, dropping names and pop culture references like a found episode of Mystery Science Theater 3000. Highland also takes pause within the narrative as the main character makes mental notes in the form of bits of song, guitar chords included. The author borrows elements of storytelling that pluck at the heartstrings of every reader, be it neo-noir, comedy, romance, tragedy, drama, or action. He stirs at the suffering of twenty-somethings living well below the line of potential, adrift without ambition or direction, crafting a souffle that both entertains and reminds us how easy it is to fall. 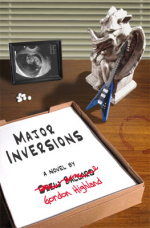 Major Inversions is the perfect addition to any bookshelf devoid of enough heart, because Highland delivers that in quantities that Ballard’s fiends could only dream about. Great review. I loved this book. You summarized it well.